SYSCO-SPOKANE WAREHOUSE EMPLOYEES WIN ORGANIZING VOTE 19-8!! This is a huge victory for the Warehouse Employees, who overwhelmingly voted yes to join Teamsters Union Local 690! Business Representative Larry Kroetch, who also represents the Sysco Drivers, worked many long hours and on holidays educating the employees and answering questions to help them make an informed decision on whether or not to have Teamsters Local 690 represent them and negotiate a fair contract for wages, benefits and job security. International Organizer Chris Rosell accepted the challenge to assist the Local in this effort and both his and Larry’s hard work paid off! 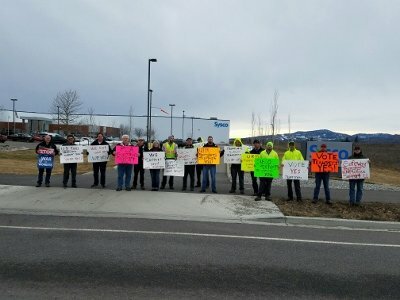 Teamsters Local 690 members from multiple employers and industries came out to show their support of the Sysco employees for their NLRB Election yesterday. CONGRATULATIONS SPOKANE SYSCO WAREHOUSE EMPLOYEES! 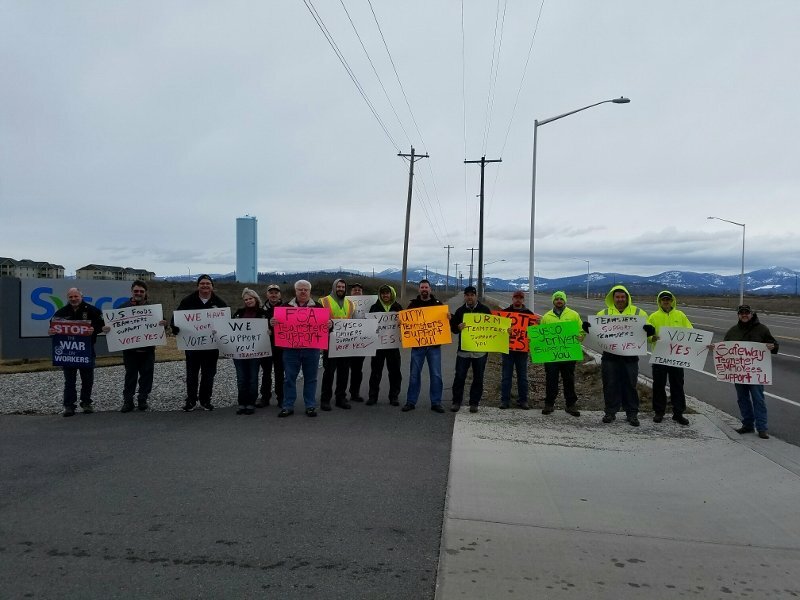 Teamsters Local 117 Members show support for Sysco Spokane Warehouse Employees that want to Organize with Teamsters Local 690. Members of Teamsters 117 who work in the food service industry are sending messages of solidarity to their Brothers and Sisters who work at the Sysco warehouse in Spokane. The Spokane warehouse group is fighting to win their Union and become members of Teamsters Local 690. A National Labor Relations Board (NLRB) election is scheduled for this Thursday, March 2. Yesterday, Sysco sent a letter to their employees’ homes trying to convince them to vote against the Union. Check out more solidarity with Spokane photos on our Facebook page here.